We drove through Lincoln National Forest, which had many forest-y mountains. The altitude change was pretty significant (4,000 feet in 25 miles as I recall). You could see the white sands of White Sands off in the distance. 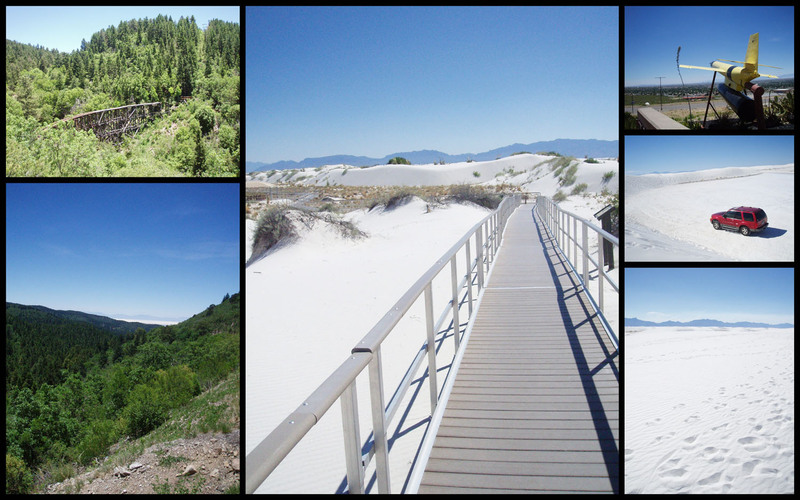 Then we went on to White Sands National Monument and drove through. It was very, very warm, so we did little walking. I did buy a used sled at the gift shop ($10 used, $14.95 new) and went down one dune. They sell sled wax. “It’s supposed to make you go faster.” The clerk claimed the green wax is actually the high-performance wax. We drove the loop road, walked on the boardwalk (where I got impressive static electric shock from walking on the plastic boardwalk…. GRRR! ), and took some photos. After our drive, I returned our sled for a small refund ($3 for used sleds, $5 for new). Mom here. What a racket they have on the sleds! Funny you mention the static shock on the boardwalk – recently shopping in a Wal-Mart, I kept getting shocked by a new grocery cart. Not pleased!